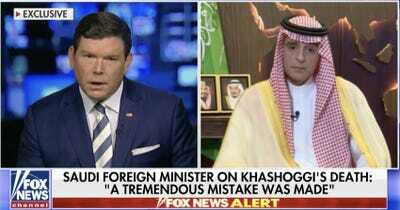 Fox NewsSaudi Foreign Minister Adel al-Jubeir spoke with Fox News’ Bret Baier on Sunday. A Saudi government official on Sunday described Jamal Khashoggi’s death as a “murder” for the first time. “We are determined to uncover every stone. We are determined to find out all the facts. And we are determined to punish those who are responsible for this murder,” Foreign Minister Adel al-Jubeir told Fox News. Jubeir’s remarks came just two days after Saudi Arabia officially acknowledged Khashoggi’s death after nearly three weeks of denials. 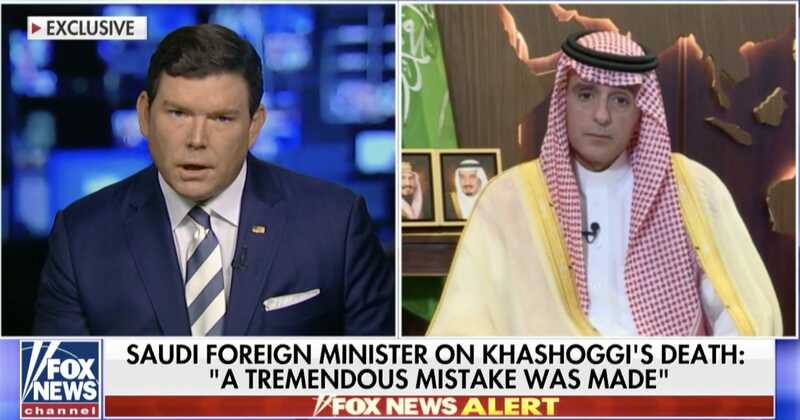 Foreign Minister Adel al-Jubeir told Fox News that the journalist’s death was a “tremendous mistake” and part of a rogue operation that Crown Prince Mohammed bin Salman had no prior knowledge of. Jubeir’s description of Khashoggi’s death as a “murder” is a stark departure from Saudi Arabia’s initial explanation of Khashoggi’s disappearance, and it comes just two days after Saudi Arabia officially acknowledged Khashoggi’s death following nearly three weeks of denials. Saudi Arabia’s latest claims surrounding Khashoggi’s fate have been met with widespread scepticism. The narrative surrounding Khashoggi’s disappearance has been shaped largely by leaks from Turkish officials to local media and other outlets, making it difficult to confirm exactly how the journalist died. The Washington Post has reported that US intelligence intercepts suggested Crown Prince Mohammed, the de facto Saudi ruler, had orchestrated a plot to capture Khashoggi. The crown prince is suspected of having far more knowledge of the operation that led to the journalist’s death than the Saudi government is acknowledging. Turkey has said it plans to release all of the details on its investigation into Khashoggi’s death on Tuesday.